For a healthy growth, an optimal haematopoiesis and for excellent performance. Liquid concentrate of trace elements and vitamins to promote healthy development, red blood cell production and improved performance. Viverosan Complex B is a concentrate, which provides all essential nutrients to ensure healthy growth, optimal blood production and performance. The trace elements support healthy skeletal development and cartilage formation. Vitamin-B-Komplex and Iron increase tha basal energy rate and support blood production. Formulated to complement the daily diet in the absence of optimal feeding- or keeping conditions. It includes components which guarantee a healthy skeletal growth and an optimal haematopoiesis. The Vitamin B complex supports the energy conversion of carbohydrates and, in addition to the haematopoiesis, also secures the regulation of cellular respiration. Vitamin K and Folic acid support the haematopoiesis and blood coagulation. Nicotine acids play an important role in the energy metabolism of horses. The added trace elements iron and cobalt are essential for a regulated haematopoiesis. Zinc and copper support an optimal building up of the various supportive and connective tissues. Selenium is important for an effective muscular metabolism. 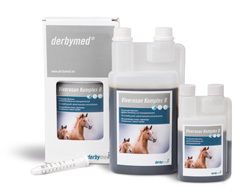 Compared to a single feed this supplementary feed contains a higher content of trace elements and may therefore only be fed to horses up to a daily amount of 1.7 % of the daily ration per animal and day.